Grilled Za’atar Chicken – Cumin Aioli – BBQ Time! Za’atar is the spice mix used on Armenian or Lebanese thyme flatbread. The way they warm up the thyme bread and stuff it with fresh tomatoes, olives, pickled turnips, mint and hot peppers in the original Arouche on Liege is divine. The kind butcher at the Metro store cut the chicken for me so I didn’t have to struggle to remember my newly learned knife skills, that I very rarely practice, on poultry. Marinate chicken in the refrigerator overnight in 2 ½ tablespoons of za’atar, garlic, olive oil, rosemary, chili, marjoram, lemon zest and juice. Bring chicken to room temperature. Season with salt and pepper. Grill on an oiled rack, for about 35 minutes, turning over as necessary, on medium high heat until the temperature reaches 160F when tested with a thermometer at the thickest part of the thigh, without touching a bone. Let it rest for 10 minutes. Sprinkle with remaining za’atar. Serve with Cumin Aioli. Combine all ingredients and serve with chicken. Finder’s credit goes to Susie Martin, my fine foodie friend. This recipe is adapted from Silvena Rowe‘s, published in the Bon Appetit July 2011 magazine. Want more Turkish grill recipe delights from Silvena Rowe? Try serving this with Jittery Cook‘s Lentil Rice with Caramelized Onion. For fresh za’atar, go to Cananut. Good za’atar needs to be fresh. Cananut has about 3-5 different varieties, from different regions. Their sumac is also good (comment from chow.com). 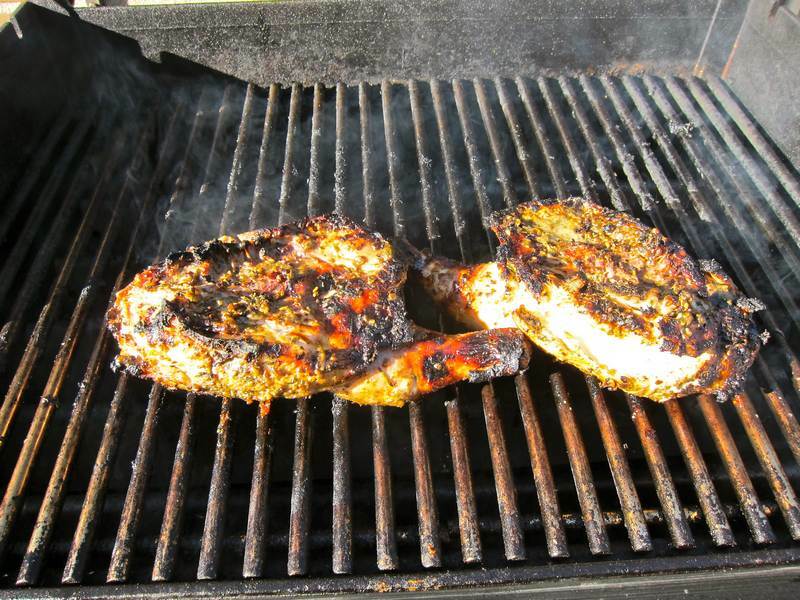 If you are following Harriet Sugar Miller‘s Eat and Beat Cancer blog, you may want to think twice about your chicken cooking methods.